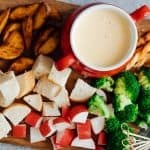 Easy Cheese Fondue Recipe with White Wine - Creamy and Indulgent! Easy cheese fondue recipe with white wine is a perfect gourmet appetizer that you can make at home! Cheeses like emmental, gruyere and cheddar work best for a silky, creamy, indulgent swiss fondue. Amazing for New Years Eve, Valentines Day or a date night! I am really taking things up a notch this season with my easy cheese fondue recipe made with white wine. 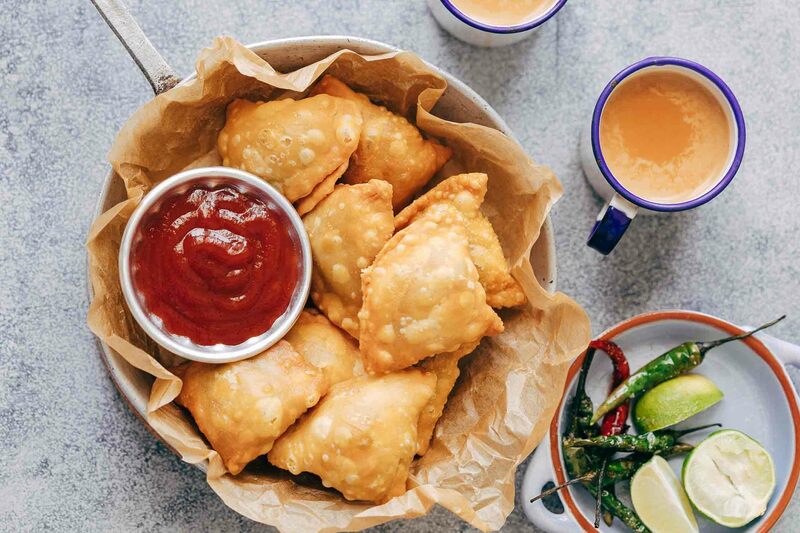 We are all about appetizers this week, and this right here is the ultimate ‘impressive’ but ‘easy’ that’ll make you the coolest host/hostess in town! Have you ever had a real fondue? With swiss cheese, white wine and one that’s rich, creamy and smooth? It’s fantastic guys! It’ll take you straight to the Alps and you’ll feel like you were sitting by the window of a Swiss restaurant dipping bite sized pieces of sourdough into a warm pot of fondue just after your first ski. For a dish that’s a real indulgence, making your own fondue is incredibly easy and needs all of five ingredients – garlic, cheese, cornstarch, white wine and seasoning. And because there are only three, it’s important to pick quality ingredients so that they really shine in this easy cheese fondue recipe with white wine. I’ve actually done all the work today, and made sure that you are equipped the next time you decide to try making a cheese fondue at home. If you can stand over a pot and stir, you can make fondue. You’ll need about 1 cup of wine per pound (450 grams) of cheese. It’s important to use a dry white wine like Big Banyan’s Chardonnay for your fondue. The acidity in the wine helps the cheese’s proteins from clumping together and turning the fondue into a stringy broken mass. Fresh lemon juice squeezed into the fondue can also help stabilize it, and add acidity and freshness that balances out the cheese. Since cheese is the key ingredient in this recipe, it’s a good idea to dole out a bit on good quality cheese. 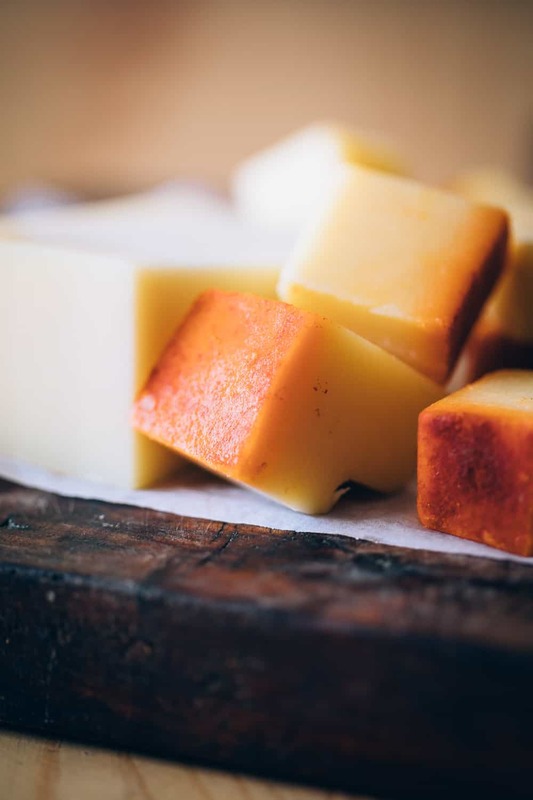 Well ripened cheese is best and a classic combination of Emmentaler which melts easy, and Gruyere which packs in flavor always works really well. Other cheeses that can be a good addition are cheddar, mild blue cheese, jarlsberg, fontina etc. You must make sure the cheese is at room temperature. Adding cold cheese to warm wine can be a sure shot way to break the fondue. It’s also important to grate the cheese so that it melts faster, and add a little cornstarch which creates a wonderful, creamy fondue. To Fondue Pot or not to Fondue Pot? The thing is, once you start making your own fondue at home, you realize how easy and affordable it is to enjoy and serve fondue. 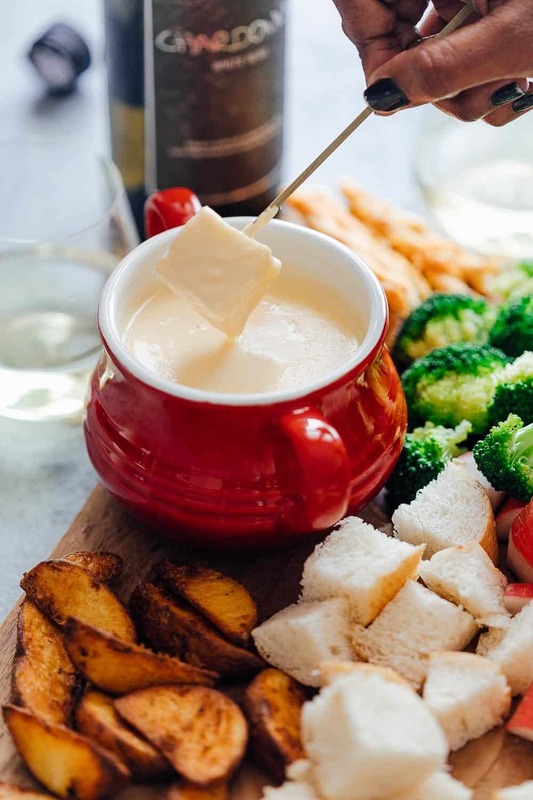 When it’s a dinner date for the two of you, or for a party you are throwing – this easy cheese fondue recipe with white wine never fails to impress. Which is why, I’d recommend investing in a fondue pot which these days are not very expensive and easily available. Once a fondue is cooked, maintaining the temperature can be quite challenging. Too cold and it thickens up and becomes clumpy, and too warm – there can be danger of it breaking up. 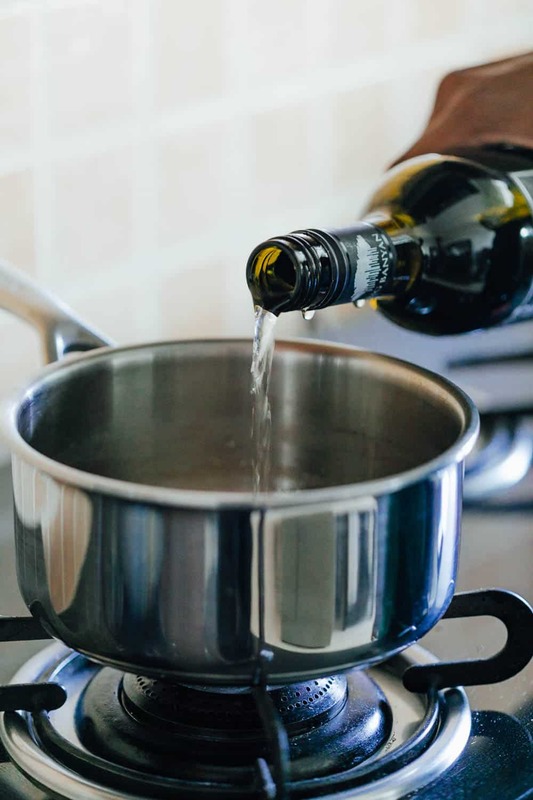 The double boiler system of a fondue pot helps maintain the temperature and keeps it perfectly creamy through the evening. Denver and I have started enjoying fondue nights, where he helps me cut up fondue dippers while I quickly whip up a fondue for us to enjoy. 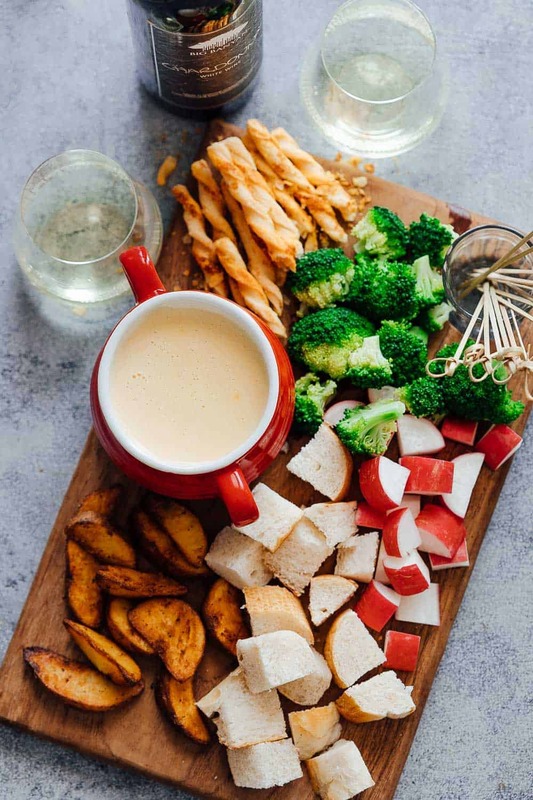 It’s my favorite date night plan – with both of us chilling with a glass of Big Banyan’s Chardonnay, putting on a favorite movie and dipping bite sized pieces of bread into a pot of cheese fondue. 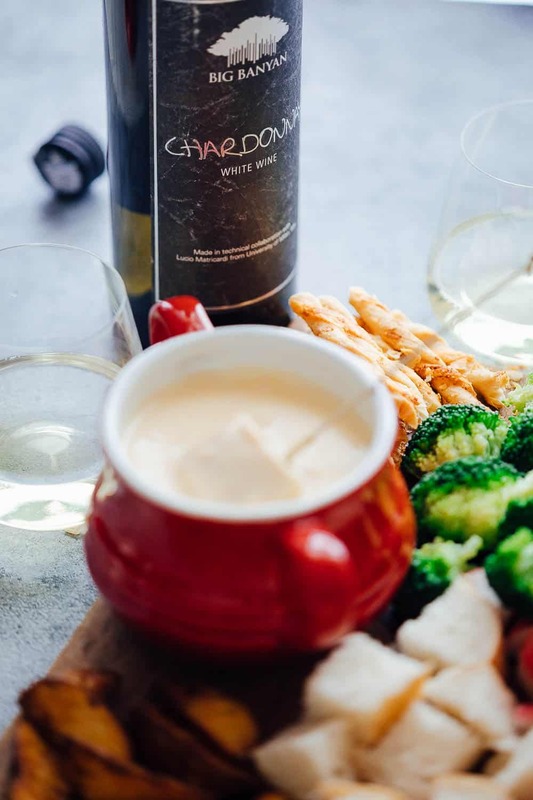 I love pairing this easy cheese fondue with the Chardonnay simply because it’s a delicate wine, and has the intense aromas of pears and pineapples, which when paired with the rich fondue, is a perfect balance. The flavors of this fondue are salty, intense and slightly tart and therefore a wine which has a mild fruity base is a good fit. 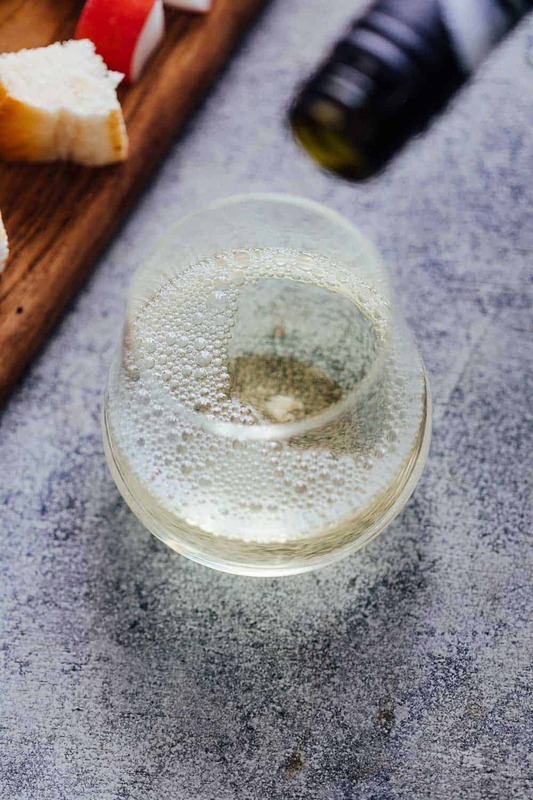 The chardonnay balances out the flavors with its minerality and acidity. We also love pairing it sometimes with Big Banyan’s Bellissima which is a dessert wine. The bellissima is not overpoweringly sweet, but will remind you of apricots and pears. It has a smooth finish and a velvety mouthfeel which is just what you need with a fondue. What do you dip into this easy cheese fondue? Do you think you can take on a fondue now? Just stir in some cheese, pop open a bottle of wine and give this a go! Prep: Shred or grate all the cheese finely and toss well with cornstarch. Cook: Add wine and garlic to a heavy bottomed pan and bring to bubbling simmer and start adding cheese by the handful. Keep whisking as you go to incorporate the cheese till the mixture is smooth and the cheese has melted. The mixture should be smooth but have a slight elasticity to it. Add the lime juice and gently stir it in. Season with salt and pepper if you like but I didn’t need to add any extra salt. Dippers: Transfer to a fondue pot and serve with dippers such as bread bites, lightly blanched broccoli, potatoes, steak bites, breadsticks etc. and chilled white wine. Make sure you keep the heat to low while cooking the fondue. 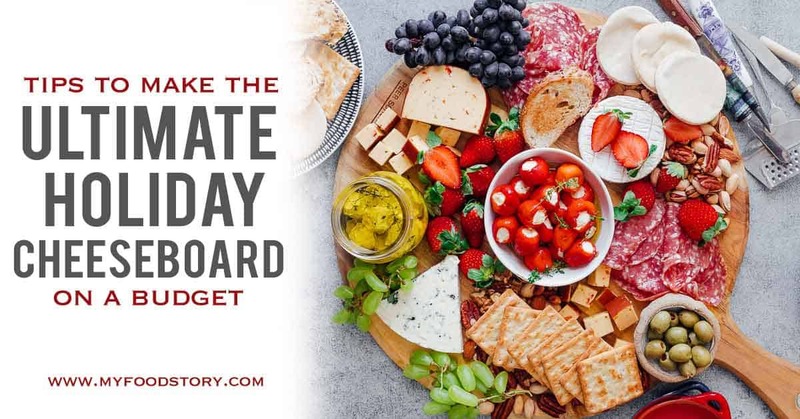 High heat can make the fondue break and you’ll be left with separate wine and cheese. If your fondue breaks and you have no other option but to throw it, try blending it in a blender. This is not authentic but it works and keeps the fondue together.